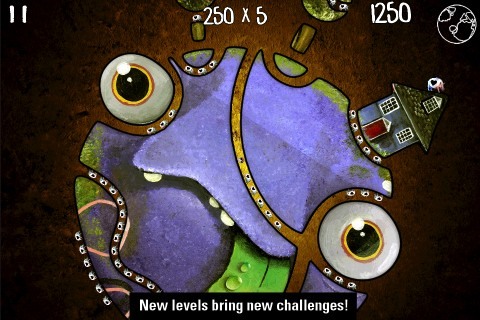 Catball Eats It All is a new game for the iPhone, iPad, and iPod touch from developer Broken Compass Studios. This app is simultaneously both different and similar to other games in its iOS genre. Catball Eats It All is best described as a 2D Katamari Damacy. As Catball, your goal is to eat everything you can, starting with tiny objects such as teddy bears, until you have grown in size to the point where you can now eat the entire level itself. If you take too long eating a level, the much larger Dogball appears and eats you instead. When an entire level is eaten, a score is given based on how quickly you’ve eaten the objects in the level; this score is presented both numerically and with stars, similar to other games such as Angry Birds. While the application only comes with twelve levels, attempting to get three stars on each one is a challenge and extends the life of the game. Catball is controlled by using your left and right thumbs to rotate the level, causing Catball to move in the direction the level is rotated. The controls are difficult to grasp at first but with practice it soon becomes second nature. However, the jumping never feels right. To jump, you hold one of your thumbs on the screen while tapping the screen with your other thumb; while it’s easy to make Catball jump, it’s the jumping itself that is difficult to control. Catball’s jumps feel light and often, he accelerates into the air far too fast, which can cause you to lose track of your position in the level. Updating this app to give Catball some weight to his jumps would go a long way towards fixing this problem. 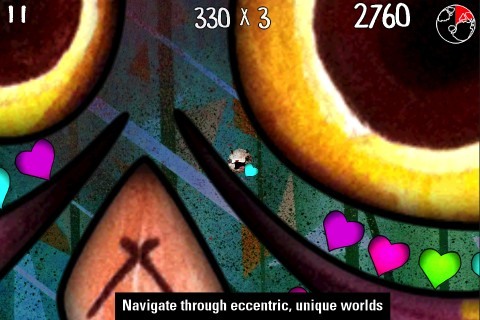 The graphics in Catball Eats It All are unlike any iPhone app currently available. Dubbed as “hand painted graffiti art,” the graphics feature realistic looking animals and people but with strange proportions. For example, Catball himself, besides being a cat in ball form, features larger than usual eyes and mouth with a smaller nose. The graphic style won’t be for everyone but Broken Compass Studios is commended for thinking outside of the box graphically. The sound and music are best described as whimsical; the songs are light-hearted, high tempo affairs that match the gameplay perfectly. This review was completed on an iPhone 4 with version 5.1 software, and Catball Eats It All played perfectly. 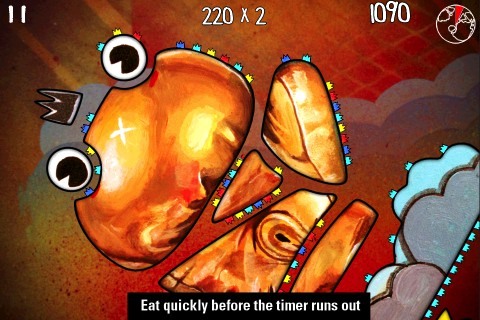 However, it does take awhile to load each level, which is not ideal for quick gaming bursts. While Catball Eats It All won’t appeal to everyone and does have some control issues, it’s easy to overlook these flaws as the app costs only $0.99 and universally runs on all iOS device types. It’s definitely worth experiencing at least once. Developer: Broken Compass Studios, Inc.
AppSafari review of Catball Eats It All was written by Joe Seifi on April 17th, 2012 and categorized under Action, App Store, Featured, Free, Games, iPad apps, Puzzler, Universal. Page viewed 3442 times, 1 so far today. Need help on using these apps? Please read the Help Page.